This statue was meant to remember and honor a celebrity. Do you recognize her? She was an actress in the ’50s and ’60s. Still no? What if I told you she was a comedienne? Red haired. Married to a Cuban bandleader. “Fix it”? I don’t see how a mere “recast” is going to fix this mess. A complete redesign is needed, a fresh start, and probably by a different sculptor. If that’s too great an expense, just do the decent thing and remove the statue. Five minutes with a bulldozer can’t be all that expensive. An anonymous Celeron citizen started a Facebook page entitled “We Love Lucy! Get Rid of this Statue,” to encourage the statue’s replacement or removal. Belatedly. It was erected in 2009. 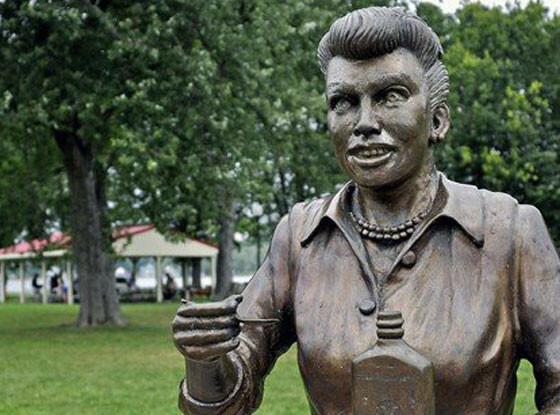 While photos may not adequately show the statue — which in reality might look better, or even worse — I agree it’s ugly and looks absolutely nothing like Lucille Ball. And shouldn’t that be the minimum requirement for memorial statues or paintings, that they at least be recognizable as the honoree? People my age remember Ball quite well. 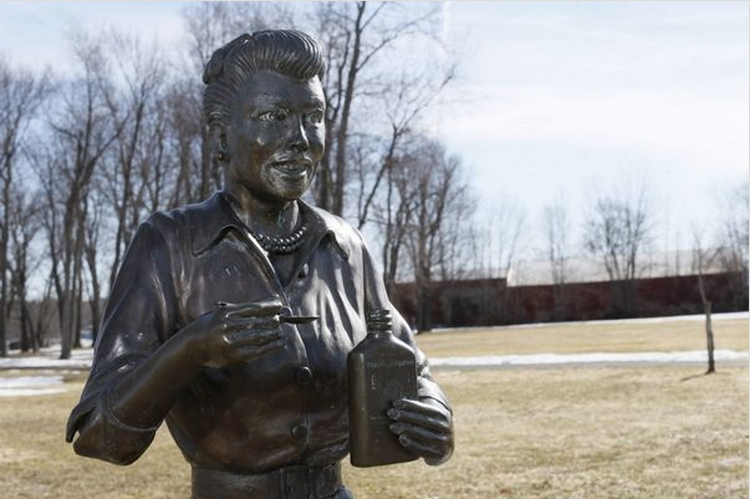 We grew up watching “I Love Lucy,” her TV show that began in 1951. But while I appreciate her contributions to the entertainment industry, my enjoyment of her faded after a stunt she pulled in ’58 or ’59 in Oklahoma City. She was to make a live appearance at one of our football games! We were beyond excited. A real celebrity was coming to see us! But then came the announcement at the game … the crowd wasn’t big enough so she wasn’t coming after all. This great celebrity couldn’t be bothered to keep her promise to a stadium full of high schoolers. I never forgave her. Hi PT, my initial thought before reading your post was that this was a poor likeness of Maya Angelou– because of her birthday, figured someone did a memorial statue. Never would have guessed Lucy! Poor little town, and i feel sorry for the artist as well. I can’t draw stick people well, so would never attempt sculpting people — gotta wonder how he thought this work looked like her. Hope everyone is happy eventually. It’s a sad situation. The tiny town probably doesn’t have a lot of money for things like this, and Lucy is apparently their one claim to fame. But the statue looks nothing like her. And I feel sorry for the sculptor too, a local man, having to hear such criticism of his work, especially when he was probably trying to do something nice for the town. Lucille Ball made her rep as a flighty gal sometimes venturing into slapstick routines, but she also was a pretty lady when appearing as herself. She doesn’t deserve this atrocity as a lasting “tribute.” It is sad that no one apparently had authority to review the sculptor’s planning or progress. Surely, the project should have been stopped. Now, the result cries out for speedy removal. If the statue was dedicated in 2009, the outcry is curiously overdue. I suppose people were trying to be polite to the local who commissioned it and the local who created it. (There’s some background information on the Facebook page.) Had I commissioned it, however, I’d have never taken delivery. Not until it bore at least a faint resemblance to the subject. 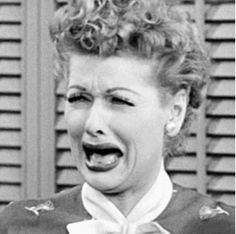 Can just imagine the real Lucy making that classic face her character always made when she realized one of her plans wasn’t going to work! I’m sure this would be her reaction if she saw the statue. Looks awful, never would have thought it was Ball. It really should be removed. It’s such a disservice to all concerned when something meant to honor an individual isn’t even recognizable as that person. Hi PT, I miss reading your posts, too. Hope all is well with you! I would never have guessed this was Lucille Ball. Doesn’t look even a little like her. She was such a pretty woman. Sad, though, that she didn’t go to your high school game because there weren’t enough people–it says something about her beauty on the inside…. Someone commented on the Facebook page that she was not very nice to “common folk.” Certainly to a famous actress high schoolers in flyover country must have seemed like real bumpkins.